« Weekend in L.A. … what’s it worth? A new top dog in the kennel? You'll always be top dog in my pack, Buddy. Well, it finally happened … the knock-down, drag-out fight we knew was coming. Unfortunately, we were in Los Angeles, and the battle for dominance in my kennel took place in Bend, Oregon. Manny, already high-strung and stressed at our week-long absence, unloaded on his uncle Buddy while our dog sitter was walking them both. Thank God, no puncture wounds or worse, but scary for her and for us. Poor Buddy, such a kind and gentle soul of a dog, now ever-doubtful of his nephew’s intent. Both will get through it, with the new pecking order (we hope) now defined once and for all. At least, I hope they will. That’s where you come in. I’d broken up earlier, tentative invitations to the inevitable battle, or they were defused by plenty of exercise and other distractions. But two male dogs (Manny intact) confined most of the day with less-than-normal exercise and an unfamiliar environment, it was only a matter of time. Am I correct in assuming it’s probably over? Or will this happen again once everyone comes home and new turf needs defining? Any advice? It was good to read your post and the comments. I kept one pup from our litter. He is now a year old today. He and dad seem to get along well. However, the pup is now a little taller and faster so he may decide to challenge. My fingers are crossed for you. Here, no further complications but we are on full alert. It is hard to say as you were not there.. and you did not state if either dog admitted defeat. And then there is the home turf thing, that could trigger it as well. Just because they are both male and Manny is in tact does not mean Manny should/will be boss. He could also be testing his position. I agree with Mike in that dogs raised together should never really severely hurt each other. We have 9 working dogs that live on this property. Our two downstairs include a 3 yr intact female, 10 month intact male, and 3 intact females upstairs and 2 intact males and 2 neutered males… Breed wise everything from labs to german shorthair and a couple vizslas. We carefully monitored first interactions but other than that we let them figure it out. And I must say due to the work we’ve put into them they all get along or mind their own business. The only time we might have trouble is when females are in heat. We follow a rule around here that the correction between dogs… the correction must be suitable for the infraction. If we feel like one dog is being too bossy or harsh we step in and reinforce everyone defaults to us. Believe it or not girls can be worse than boys as far as continual bickering. Not sure if that helps at all but just thought I would share what goes on here at out kennel. Oh and I wouldn’t worry so much about it in the field. Unless you have an obnoxiously dominant (and IMO unbalanced) dog they should not take it to the field much. 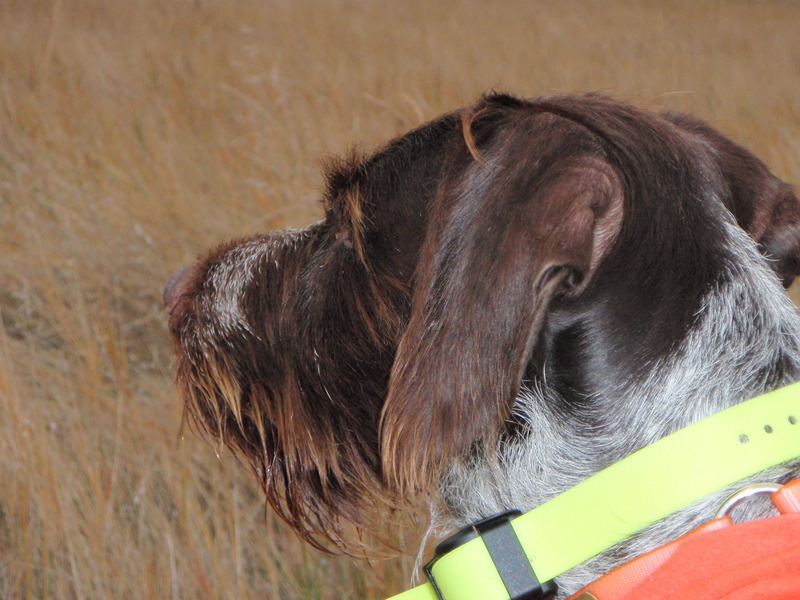 Even with how picky and rather snarky can be with strange dogs she has never had an issue in the field, she just wants to hunt. Thanks Anna, I’m beginning to think much of this was predicated on MY absence, as “alpha male.” Also, less exercise than they are used to. They are getting along famously now that we are home again. Scott ,It only hurts for a little while! OH it will happen again , Once Buddy starts to show he is still the bosses king dog ,Manny will plot his day to unseat the crown until Buddy allows Manny the thrown. Hopefully the over taking of leadership has no ill effects in the field. Dominance has it place in the animal kingdom and it will prevail . Hang in there lord Buddy. Only time can finish this little problem. Dogs raised together wont normally hurt each other severely unless they are raised for that type of fighting. These are domestic animals not lions in the bush. Very good points – will keep you posted now that we are home and everyone is settling in again. Thanks for the reminder – update on the rig build-out to come soon.